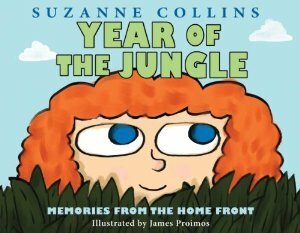 Year of the Jungle is an autobiographical picture book by Suzanne Collins. Scholastic Inc. announced in December, 2012 that the author has completed the book and that it's scheduled to be released on September 10, 2013. The book contains 40 pages with illustrations and art by James Proimos, a friend of Collin's. It's based on Collins' interactions with her father during the time he served as a career air force officer in Vietnam. It tells of a young girl named Suzy and her fears when her father leaves home to go to war. The picture book is intended for children aged four and above. James Proimos, the one who illustrated Year of the Jungle is an accomplished illustrator and author. Among his most well-known works are Paulie Pastrami Achieves World Peace, 12 Things to Do Before You Crash and Burn, Raisin and Grape, The Best Bike Ride Ever, and Knuckle and Potty Destroy Happy World. The Underland Chronicles - This is a series of five fantasy novels. The first one was published in 2003 and the fifth one was published in 2007. The titles in this series are as follows in the right order: Gregor the Overlander, Gregor and the Prophecy of Bane, Gregor and the Curse of the Warmbloods, Gregor and the Marks of Secret, and last but not the least, Gregor and the Code of Claw. The main characters in the series are Gregor, Luxa, Ares, Ripred, and Howard. The books chronicles the adventures of a boy named Gregor in Underland, a mysterious land located under the city of New York. The Hunger Games Trilogy - These are the books that really placed Suzanne Collins in the literature map. The popularity of these books soared even further when the first book was adapted into a major Hollywood film that starred Jennifer Lawrence, Josh Hutcherson, Liam Hemsworth, Woody Harrelson, and Donald Sutherland. The other two books in the series will also be adopted into films with the second one coming out in 2013. Collins' other works include Fire Proof: Shelby Woo #11, When Charlie McButton Gained Power and When Charlie McButton Lost Power.